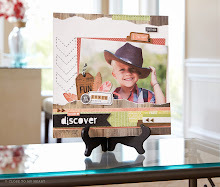 Stamp Happy: It's National Stamping Month Again - Let's Celebrate! It's National Stamping Month Again - Let's Celebrate! 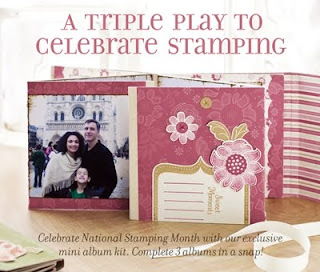 Close To My Heart is celebrating National Stamping Month! Celebrate with a Triple Play! ONE'S GOOD. TWO'S GREAT, and three's best of all! Celebrate your love of stamping by using stamps to embellish the three min-albums in our exclusive National Stamping Month kit, Triple Play. With Mini-Inks, stamps, albums and pre-cut accents for stamping, you'll complete all three albums in a jiffy. Since each album has its own color scheme, all three are unique (Hollyhock, Desert Sand/Sunset (NEW COLOR!) and Indian Corn Blue) and are ready for many different kinds of photos. Make one for yourself and two to give away - if you can bear to part with them! 3. Spend $40 on My Acrylix stamps and get Triple Play for only $5! 5. Join Close To My Heart as a Consultant in September and get the kit for FREE! Online orders count, too! So if you want it NOW, click here to start shopping! You'll be glad you did, these albums are so cute! ~L.